Most theories of exchange rate determination predict depreciation in the higher-inflation country’s currency. Inflation refers to an increase in the average price level of a country, which is frequently measured by the consumer price index (CPI). The figure shows the change in the yen–dollar exchange rate and the change in the Japanese CPI. Credit: Notes: International Financial Statistics of the IMF. cher and chcpi indicate the percent change in the exchange rate and the consumer price index, respectively. Data are available at www.imf.org. Again, you can see higher volatility in the exchange rate compared to changes in the consumer price index. In terms of the relationship between the exchange rate and the inflation rate, certainly the observation in 1974 is consistent with the theory’s expectation: As the inflation rate approached 25 percent, you observe a depreciation of the yen about 5 percent. As another example, in 1986, as the inflation rate declined, you observe an appreciation of the yen approaching 15 percent. The following figure shows the relationship between the change in the rupiah–dollar exchange rate and the inflation rate in Indonesia. Again, the spike in the exchange rate and the inflation rate indicates the Asian crisis. 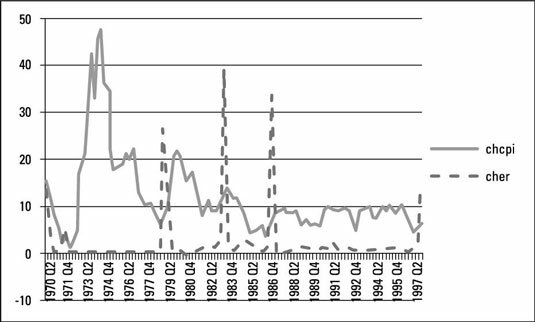 The 136 percent depreciation in the rupiah in 1998:Q1 was accompanied by higher inflation rates that reached 78 percent in 1998:Q4. Because of the outliers associated with the Asian crisis, seeing the relationship between changes in the exchange rates and the inflation rates is difficult. 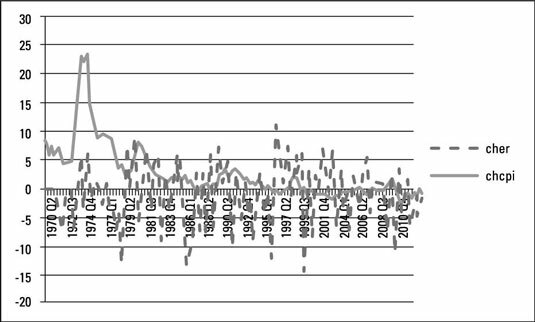 Therefore, the next two figures indicate the pre– and post–Asian crisis periods, respectively. 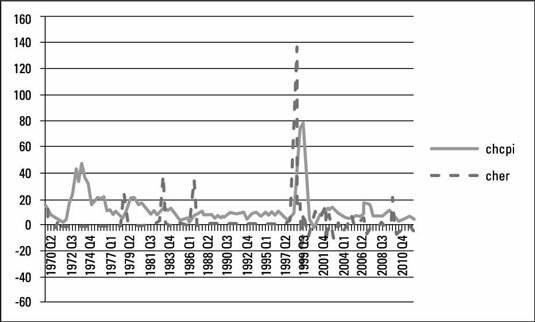 Here, spikes in the change of the exchange rates indicate major depreciations, reaching almost 40 percent in the early 1980s. They’re accompanied by higher inflation rates. However, the relationship between changes in the exchange rates and inflation rates is almost nonexistent during the 1970s and the late 1980s and 1990s. This figure shows the changes in the rupiah–dollar exchange rate and inflation rates in Indonesia during the post–Asian crisis period. 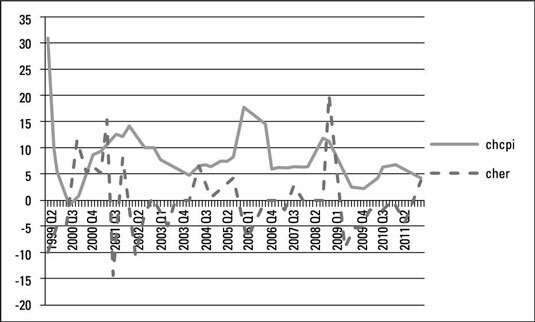 Higher inflation rates and depreciation in the rupiah coincide during the later quarters of 2001, the early quarters of 2004, the later quarters of 2005 and 2008, and the early quarters of 2010. Lower inflation rates and appreciation in the rupiah coincide with the early quarters of 2002 and 2003. However, in early 2006, although the inflation rate is above 15 percent, the rupiah appreciates more than 5 percent.